GRANDMA'S PAINTING was created because the Artist's maternal grandmother asked him to make a painting for her. She was ninety-three at the time. Although he generally does not make paintings specifically for other people, and especially not portraits, it was impossible for him to refuse the request. Most people would not characterize this painting as a portrait, but the Artist believes it provides a clearer picture of his grandmother than a straightforward representation. The setting is an idyllic Shangri-la with highly stylized landscape elements that are common in Tibetan painting. It has an unblemished sky that contains both a moon and a sun, indicating its timeless quality. Purple mountains and clouds materialize from the mists in the far background and then descend into gently sloping hills. The entire composition has been established using an iconometric grid that ensures that the picture remains balanced, and a Mannerist technique has been employed in the zig-zag shape of water that leads the viewer into the middle ground. The wellspring that pours out from the left of the page is derived from a Da Vinci drawing. It creates eddies, waves and whirlpools as it converges with the stream. This very scientific observation of natural forces is also common in Tibetan art, which uses fractal geometry to show the patterns created in nature. Emerging from the water is a large rock formation that is surmounted by a prolific apple tree representing the one my grandparents nurtured in their back yard. Aside from its obvious Biblical reference to the Tree of Knowledge in Genesis, it also symbolizes the crucifixion and the bodhi tree under which the Buddha meditated and attained enlightenment. In Tibet, there are stories of monks who reach nirvana and exit their physical body in the form of rainbow light, leaving behind only their robes, hair, and fingernails. There is a representation of this in the lower left corner, and it forms the major action in this painting. The two rainbow paths exiting from the head and hands lead across the water to a mirror in which the viewer can see herself. Real gold is used for the color of the mirror and the monk’s robes. Buddhism is known as yana, or ferryboat, and it carries the practitioner to the ‘yonder shore’ of nirvana. Although I have chosen to represent it primarily through Buddhist symbols, this ‘crossing over’ experience is part of all great faiths and it is a universal theme. Supporting this mirror are the hands of a giant invisible Buddha who is not on this physical plane and thus defies spatial conventions. He makes the earth-touching mudra, or hand gesture that the Buddha displayed when he conquered the forces that attempted to bind him in samsara, the life, death, and rebirth cycle of suffering. The roses are present because they were Anand's grandmother’s favorite flower and because of the rose garden in her yard that came into bloom each spring. There is an inscription in the lower right corner indicating that the painting is for her. 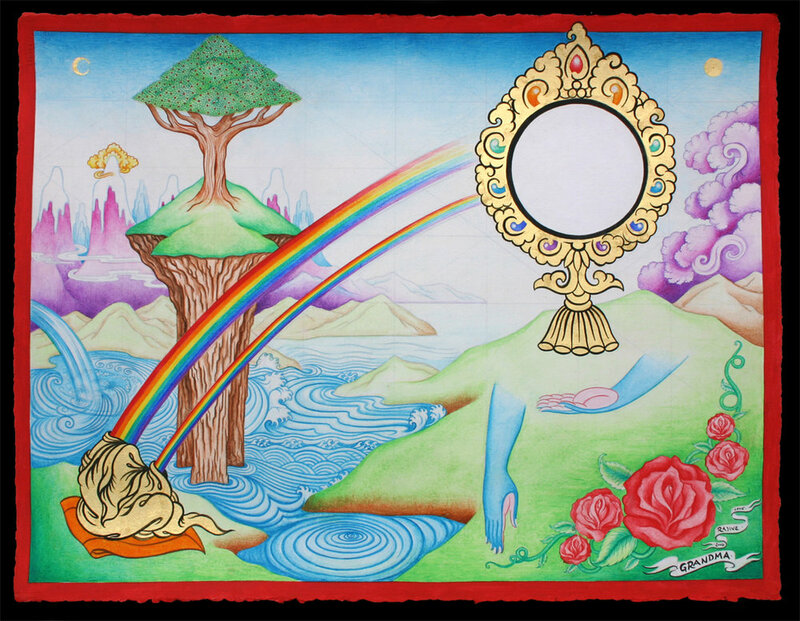 This painting is designed to help the viewer prepare to leave the world of illusory phenomena by following the example of the monk, who, through contemplation has transcended it and disappears into the formless void of the mirror, which contains nothing but reflects everything all at once.